Why Proactive employees are successful? They believe at all times that they have a choice. Why few employees get very good or excellent rating during performance appraisals? Why few employees get promoted? Why few employees don’t get opportunities in spite of their so called hard work? And why only few employees lead teams? If you ask me, I will say that those who get good career opportunities have potential and are more pro-active than others. Few employees just follow what managers tell. They neither try to change the system nor give any suggestions & ideas to improve. Most leaders and managers want employees who can manage themselves, make decisions without careful direction, and take responsibility. Whether it is front-line customer service employees taking it upon themselves to ensure that the customer gets the best experience possible, or a team leader engaging in creative problem-solving of their own, rather than bringing every issue to the boss. Proactive employees constantly find new and better ways of doing their work. What exactly does it mean to be a proactive employee? We can identify this in two ways, first, we examine who and what a proactive employee is. Then we look at what a proactive employee is not. 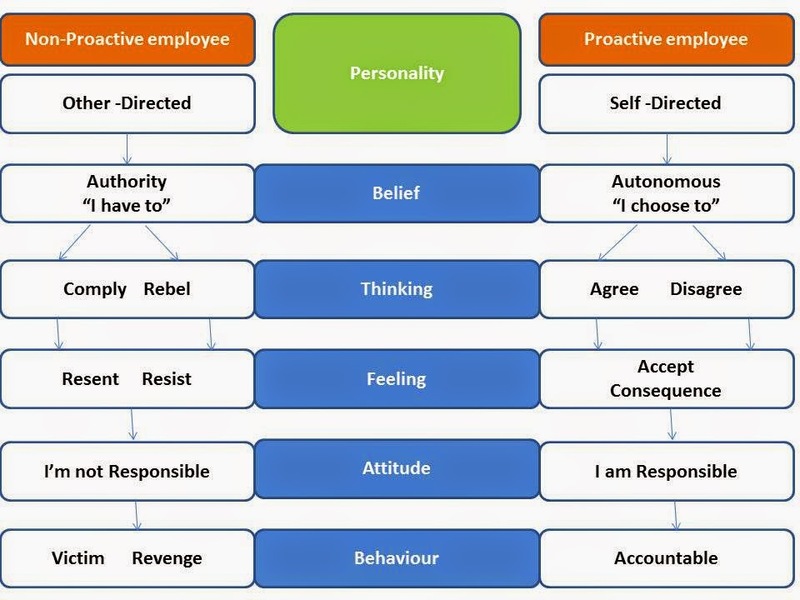 You will find that proactive employee is “self-directed” and non-proactive is “other-directed.” The self-directed employee takes responsibility for his own decisions and actions. The other-directed employee adopts an “I have to” mentality, and responds only to direction. Other-directed people believe they have no control over their own lives and instead are controlled by people in authority. For an other-directed person, the locus of control is external to himself. When employees comply and do something they do not want to do, their natural feeling is to resent the authority for forcing them to do it. Even though the other-directed employee will eventually complete the task, he will do it grudgingly, and only well enough to avoid trouble. Whether other-directed people comply or rebel, their attitude is: I am not responsible. They either behave like victims, feeling sorry for themselves and complaining to friends and co-workers about the boss, or they plot revenge. Sometimes they will do both. In either instance, their intention is to undermine, a leader, want to accomplish. 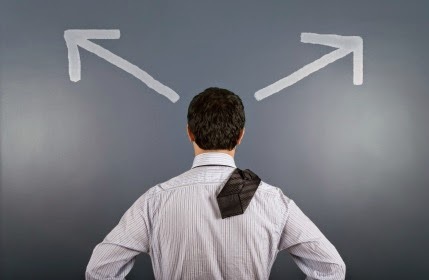 The central difference between other-directed and self-directed team members is that self-directed people believe at all times that they have a choice. When you ask self-directed employees to do a new task, their thinking is to either agree or disagree with doing it. If they agree to do the task, then they will do it to the best of their ability, because it is their choice. If they disagree, they will explain to their manager the reasons why they disagree. Either way, the feeling that self-directed people have is one of acceptance of whatever the outcomes are of their decisions. They accept the consequences of their actions because they feel ownership of them. If self-directed team members agree to do a job and do not do it to expected standards, then they will accept the consequences for not having given their best. If they disagree with the task, and there are negative consequences for doing so, they will accept these consequences, too. That’s what self-directed people do. Prior to making decisions they consider the consequences of the decision, then act based on their understanding of those consequences. Since self-directed people are responsible, they are only likely to disagree when they believe that what they are being asked to do is unreasonable, or is the wrong thing to do.